A few species of the north temperate zone; only the following known in North America. Type species: Arethusa ophioglossoides L.
Sepals and petals nearly equal and alike: lip bearded. Sepals longer and narrower than the petals; lip not bearded. Arethusa ophioglossoides L. Sp. PI. 951. 1753. 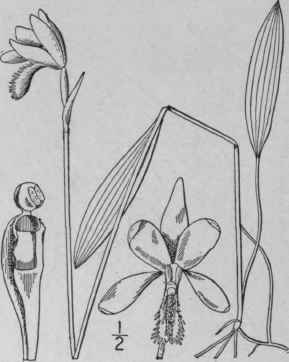 Pogonia ophioglossoides Ker, in Lindl. Bot. Reg. pi. 148. 1816. Stem 8'-15' high, 1-3-leaved, not rarely with a long-petioled basal leaf. Stem leaf or leaves 1/2'-3' long, lanceolate or ovate, erect, bluntly acute; flowers fragrant, pale rose-color, slightly nodding, large, solitary or occasionally in pairs, subtended by a foliaceous bract; sepals and petals about equal, elliptic or oval, 6"-10" long; lip spatulate, free or somewhat appressed to the column below, crested and fringed; column much shorter than the petals, thick, club-shaped. In meadows and swamps, Newfoundland to Ontario, Minnesota, Florida, Kansas and Texas. Also in Japan. Roots fibrous. Propagates by runners. Adder's-mouth pogonia. June-July. Arethusa divaricata L. Sp. PI. 951. 1753. 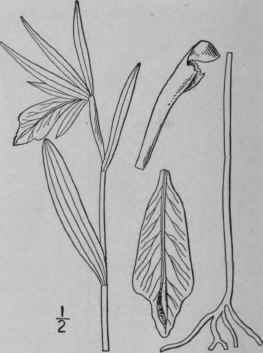 Pogonia divaricata R. Br. in Ait. Hort. Kew. Ed. 2, 5: 203. 1813. Stem i°-2° high, bearing a leaf near the middle, and a foliaceous bract near the flower. Leaf lanceolate, or narrowly elliptic, obtuse, clasping, 2'-4' long; flower terminal, solitary, about 1' long; sepals linear, longer and narrower than the petals, diverging, dark colored; petals flesh-color, lanceolate, narrowed at the apex, lip as long as the petals, 3-lobed, crenulate or wavy-margined, greenish, veined with purple, crested, but not bearded, the upper lobe long. In swamps, southern New Jersey to Florida and Alabama. Ascends to 4000 ft. in North Carolina. July.